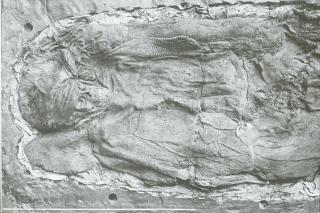 In 1935, Skrydstrup Woman was found in a burial mound in South Jutland. She was lying in an oak coffin in a well-preserved costume, just as she was when she was buried one summer's day in about 1300 BC. She was wearing a short-sleeved blouse of woven wool with embroidered sleeves and neckline. A long piece of woollen cloth served as a skirt. Her hair was combed, put up and covered by a hair net. She also had a fine bonnet with her. Rings of gold lay by her ears showing that she belonged to the elite. Archaeologists from Haderslev Museum have excavated an early Bronze Age settlement just a few hundred metres from Skrydstrup Woman's grave. It contained one of the largest prehistoric Danish houses ever found, 50 metres long and 10 metres wide, a hall of almost princely proportions. Other houses, almost as large, were excavated at the same time. Clearly not just anyone lived here. It was the home of a powerful chieftain's family. The huge house must have been in use when Skrydstrup Woman was alive. It's fascinating to think that we know where she lived and grew up. And if the hall wasn't her childhood home exactly, she is sure to have popped in for a visit.